Staatliches Museum für Naturkunde Stuttgart. Stuttgart, Baden-Württemberg, Germany. Not so long ago I have devoted a good deal of time and effort analyzing Egyptian mythology in the Shin Megami Tensei: Persona video game series (Salvador, 2015). Thus, it was only natural that I would come back to the topic after the release of Persona 5 (Atlus, 2017) earlier this year. In my former article, I discussed all the Ancient Egyptian deities and monsters who appeared in Persona games. These included the “top brass” of the Egyptian pantheon, like Isis and Horus, alongside several others. Persona 5, unfortunately, did not add any new deities to the series roster, but it brought a worthwhile mention to one very peculiar god: Medjed. In Persona 5, Medjed is the name of a group of hackers. Better put, it was the pseudonym of one lovely little hacker (Fig. 1) that later became the name of the whole group. Honestly, I was really surprised to see Medjed referred to in the game, because he is a very minor god. I am talking extraordinarily minor here, maybe barely qualifying to the rank of deity: he is absent from nearly every textbook and encyclopedia of Egyptology. I remembered his name because of his very unusual appearance (as we will see below) and also, pretty much accidentally, knew something about the very scarce mythology behind him — he is mentioned only a couple of times in all inscriptions we currently have from Ancient Egypt. In any event, I was baffled as to why the game’s writers had chosen Medjed. He certainly fits the bill for the whole hacker thing, but so would many other deities and mythological monsters, from Egypt or elsewhere. And so I decided to investigate the matter of Medjed’s popularity in Japan. But before getting into that, let us learn a little bit about this god. Figure 1. Support’s on the way! 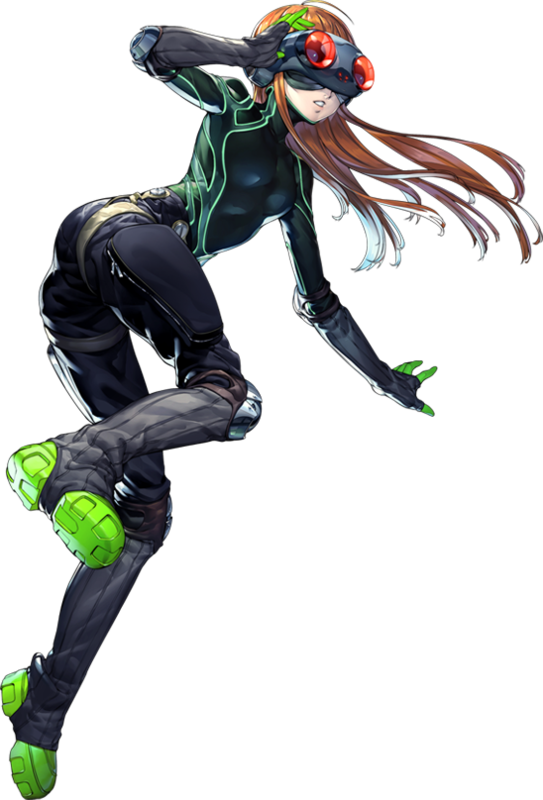 (Image taken from Megami Tensei Wiki: http://megamitensei.wikia.com/). Figure 2. Sheet 12 of the Greenfield Papyrus. Picture is a courtesy of the British Museum (©Trustees of the British Museum). Figure 3. Sheet 76 of the Greenfield Papyrus. Picture is a courtesy of the British Museum (©Trustees of the British Museum). 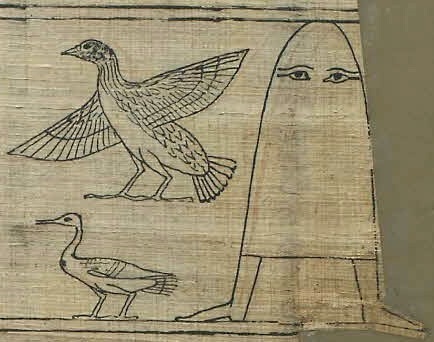 Medjed is featured on the papyrus sheets from Figures 2 and 3. So let us take a closer look at him: he is a shrouded form, like a cartoon ghost (Figs. 4 and 5), but sometimes is described as a mound with eyes and feet (British Museum, 2017). 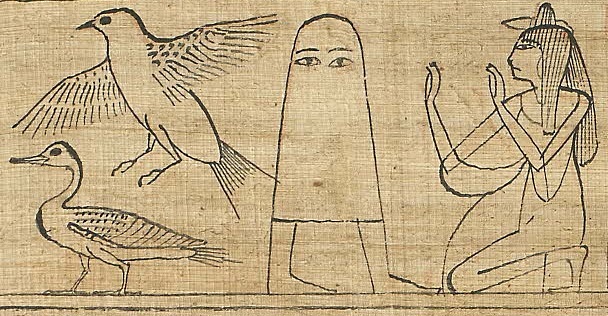 Due to his odd appearance, Medjed is just impossible to miss and/or to ignore, even to the most casual of observers. Figure 4. Close-up of Sheet 12 of the Greenfield Papyrus (from Fig. 2) showing Medjed. Just in case, he is the one on the right. Figure 5. Close-up of Sheet 76 of the Greenfield Papyrus (from Fig. 3) showing Medjed. The text on the papyrus (Fig. 2) names him Medjed (sometimes spelled as “Metchet” in older literature) and says that he “shooteth forth light from his eyes, but is himself invisible” and that he “revolveth in heaven inside a flame produced by his own mouth, whilst his own form is invisible”. This translation is according to Budge (1912); although this researcher is a rather controversial figure in Egyptology and his translations are very outdated (for instance, see Goelet et al., 2015), this was the only translation of the Greenfield Papyrus that I could reach. Regardless, it largely agrees with later research on Medjed. The passage above is part of Chapter 17 (or Spell 17) of the Book of the Dead. So another place to look for Medjed is the same Spell 17 from other copies of the Book of the Dead (they vary, as I will explain later). As expected, we can find mentions of Medjed in other New Kingdom (and later) papyri, including a group of papyri known as the “Theban Recension of the Book of the Dead”. Spell 17 of these papyri are similar to that of the Greenfield Papyrus, but bearing some differences. According to Budge (1898): “I know the being Mātchet [Medjed] who is among them in the House of Osiris, shooting rays of light from [his] eye, but who himself is unseen. He goeth round about heaven robed in the flame of his mouth, commanding Hāpi [god of the annual flooding of the Nile], but remaining himself unseen.” A new translation of this passage is given by Faulkner et al. (2008) and Goelet et al. (2015): “I know the name of that smiter among them who belongs to the House of Osiris, who shoots with his eye, yet is unseen. The sky is encircled with the fiery blast of his mouth and Hapi makes report, yet he is unseen.” Medjed is here named “the smiter”, or perhaps his name is translated to “smiter”. This translation rather deindividualizes Medjed, turning him into just “a smiter”: nearly all gods (and mortals) were prone to smite enemies. To summarize all the information above, Medjed is unseen (hidden or invisible), can fly, can shoot rays of light from his eyes, can breathe fire (like our usual dragon, maybe) and can smite other beings. Besides this, nothing else is known about this god. In any event, Budge (1904) lists Medjed (as Mātchet) in his chapter on “Miscellaneous Gods”, but whether this refers to the same god is uncertain. There, Budge lists the deities who protect Osiris during the 12 hours of the day and the 12 hours of the night; one of them is Medjed. More specifically, Budge (1904) reports that Medjed watches over Osiris during the 1st hour of the day and the 12th hour of the night. This is in line with the passage in Spell 17 where Medjed is said to belong to the House of Osiris, but I could not trace any more recent work reporting this (and Budge’s work, as explained above, is mostly shunned by Egyptologists). Now let us make a brief pause to talk a little about the Book of the Dead. The most important questions to address are: (1) What is it? (2) How it came to be? (3) Is it a single book or is there more than one? The Book of the Dead is a collection of funerary texts; its use was widespread and lasted for over one and a half millennium (Munro, 2010). The Egyptians called it the “Book of Coming Forth by Day”, but “Book of the Dead” was more appealing to the modern audience. The book contained hymns praising the gods and several magical spells (for an example, see Box 1) to protect and guide the deceased through the perilous journey through the Duat, which is the Egyptian underworld (Taylor, 2010). The journey to a nice afterlife was riddled with dangers, fiends and tests, and the deceased needed all the help he/she could get. The Book of the Dead was not a new invention, however. On the contrary, it has a long history, as it is derived from older writings. During the Old Kingdom, starting in the 5th Dynasty, funerary texts were written on the walls of the burial chambers inside the pharaoh’s (and later also the queen’s) pyramid (Munro, 2010). These texts, written in hieroglyphic script, are called “Pyramid Texts” — a rather uninventive name, maybe, but efficient nonetheless. They were meant to help the deceased king to reach his rightful place among the gods in the afterlife. Later on, the right to an afterlife ceased to be a royal privilege and first the elite and then everyone was granted access to it (D’Auria et al., 1989). During the Middle Kingdom, the spells started to be written on the inner side of the coffins (sometimes also on walls and papyri). They are called, as you may have already guessed, “Coffin Texts”. Many new spells were added to the repertoire and they were, for the first time, illustrated. Afterwards, new spells were developed and everything started to be written on papyrus; the Book of the Dead thus came into being. The spells could be written either in hieroglyphic script or in hieratic (a cursive form of the hieroglyphs) and were usually richly illustrated. The oldest known Book of the Dead is from Thebes (around 1700 BCE), during the Second Intermediate Period, and by the New Kingdom, the Book had already become very popular (Munro, 2010). The most important thing to understand is that there is not a canonical Book of the Dead: when a person commissioned his/her own copy of the Book, they could choose the spells they wanted. Also, there are some differences among books even for the same spells, which can be due to poor copyediting, deliberate omission of parts of the spell or simple evolution through time. To the modern public, the best-known scene from the Book of the Dead is the Judgement, or the “weighing of the heart” (Fig. 6). This was the most critical step of the journey to the afterlife. The heart of the deceased was weighed against the feather of Maat, the goddess of truth, balance and order. If the person behaved in life in accordance with the principles of Maat, he/she would be granted access to the afterlife. Otherwise, his/her heart would be devoured by Ammit, a goddess whose body was a mix of crocodile, hippopotamus and lioness. This so-called “second death” was permanent and thus much feared by the Egyptians. So now that this is out of our way, let us return to the original question. Why was Medjed chosen for Persona 5? What does he have to do with Japan anyway? Figure 6. 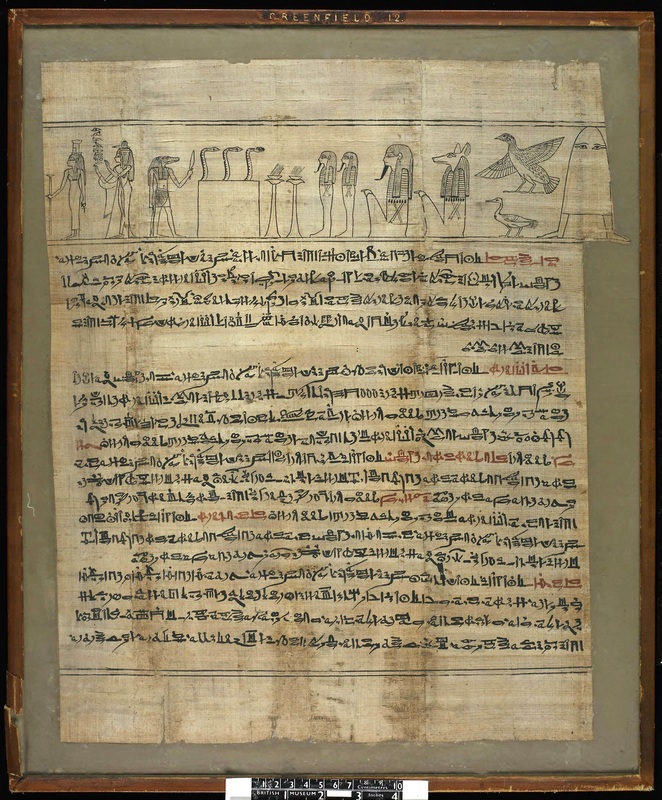 Frame 3 of the Papyrus of Ani (19th Dynasty, ca. 1250 BCE), showing the Judgement scene, also known as “weighing of the heart”. Anubis performs the weighing and Thoth records the proceedings. Ammit waits close by in case she has to devour the deceased’s heart. Picture is a courtesy of the British Museum (©Trustees of the British Museum). I have flown up like the primeval ones, I have become Khepri, I have grown as a plant, I have clad myself as a tortoise, I am the essence of every god, I am the seventh of those seven uraei who came into being in the West, Horus who makes brightness with his person, that god who was against Seth, Thoth who was among you in that judgement of Him who presides over Letopolis together with the souls of Heliopolis, the flood which was between them. I have come on the day when I appear in glory with the strides of the gods, for I am Khons who subdued the lords. As for him who knows this pure spell, it means going out into the day after death and being transformed at will, being in the suite of Wennefer, being content with the food of Osiris, having invocation-offerings, seeing the sun; it means being hale on earth with Re and being vindicated with Osiris, and nothing evil shall have power over him. A matter a million times true. —Translation by Faulkner (2010: 80). Parts of the Greenfield Papyrus were on public display in Japan during the year of 2012 as part of special exhibitions about the Book of the Dead at the Mori Art Museum in Tokyo and the Fukuoka Museum of Art (British Museum, 2017). Visitors to the Tokyo exhibit quickly took notice of Medjed’s strangely manga-like appearance and photos of him (on the papyrus) started to circulate on Twitter (Stimson, 2015). As often happens on the Internet, fan art of Medjed started to pop up: there were drawings, comics, toys, cookies, you name it. Soon, any Japanese Medjed fan was able to buy merchandise of the god (Fig. 7). Figure 7. Left: Plush Medjed (lasers not included). Source: Rakuten Global Market (https://global.rakuten.com). 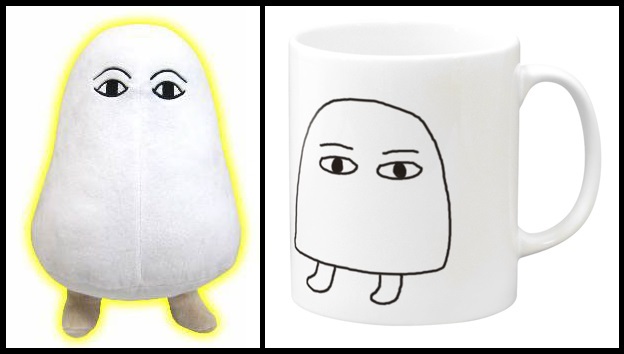 Right: Medjed mug. May this coffee smite your fatigue away! Source: Suzuri (https://suzuri.jp). Curiously, as the translations of the text from the Greenfield Papyrus said Medjed “shooteth forth light from his eyes”, some of the fan art started to depict him — obviously — firing lasers from his eyes. He was also shown flying, which is another of the “superpowers” assigned to him in the Greenfield Papyrus. However, up to my knowledge, no fan art alludes to his fire-breathing ability. Medjed was becoming an icon in Japanese pop culture and there was only one thing left to solidify his position as such: video games. 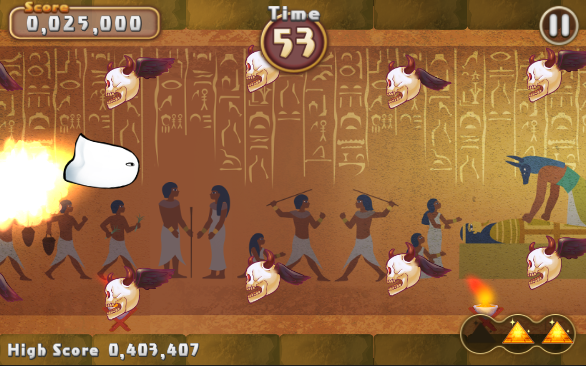 In early 2014, the game Flying Mr. Medjed was released for mobile phones (Fig. 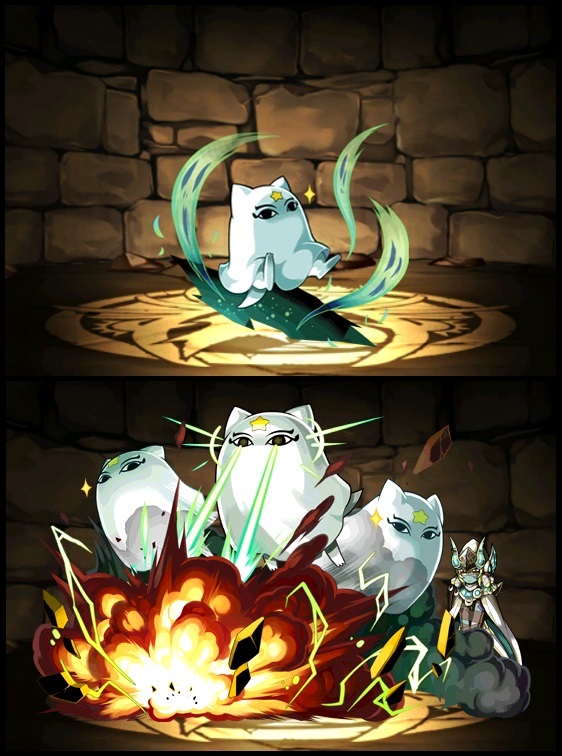 8) and later on the same year, Medjed appeared on the popular Puzzle & Dragons game (as the character Medjedra; Fig. 9). In this case, the god’s power to shoot “forth light from his eyes” is a pair of laser beams, like those earlier fan art pieces. Figure 8. Flying Mr. Medjed. Screenshot of the game. Figure 9. Medjedra, from Puzzle & Dragons. Source: Puzzle & Dragons Wiki (http://pad.wikia.com/). 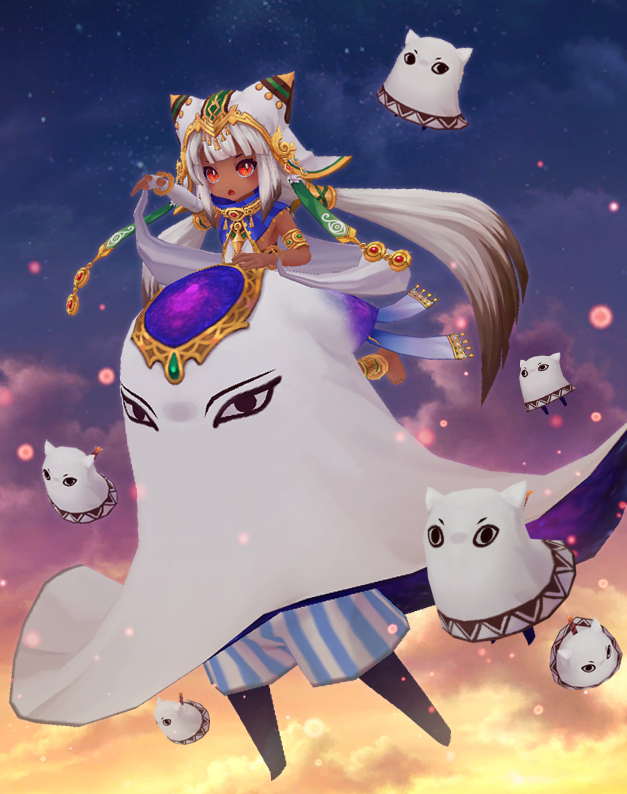 Medjed was also included in the MMORPG Aura Kingdom in a manner very similar to that of Puzzle & Dragons (with lasers), but this time under the name Nakama and accompanying a character named Zephyrine (Fig. 10). Figure 10. Zephyrine and Nakama/Medjed, from Aura Kingdom. Source: Aura Kingdom Wiki (http://auraking dom.wikia.com). 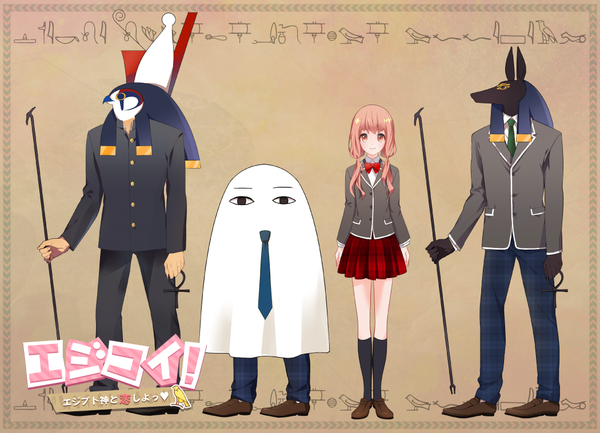 Then — and perhaps unavoidably when dealing with Japan — Medjed starred in a dating sim. The game is called Ejikoi! (Fig. 11), which translates to something along the lines of “Egy-love”. The player takes control of a high school girl looking for romance with one of her classmates, who all happen to be Egyptian deities. As weird as this game may sound, some people must have really liked it, because it is getting a sequel soon. Figure 11. Characters from Ejikoi! Source: Ejikoi Official Twitter (https://twitter.com/ejikoi_official). Finally, the god got his own anime series in 2016, Kamigami no Ki (translated simply as “Chronicles of the Gods”; Fig. 12). The animated series shows Medjed’s misadventures alongside his pantheon fellows Ra, Anubis and Bastet. Figure 12. The cute gods of Kamigami no Ki. Source: MyAnimeList (https://myanimelist.net/). With such a solid background in Japan’s pop culture, it then became clear to me why Medjed was chosen for Persona 5 in spite of dozens of other more “traditional” candidates. However, instead of flying around and shooting lasers from his eyes, Persona 5 focuses on the god’s role as a smiter and the fact that it remains unseen — both good choices for a shadowy hacker group. As an enthusiast of everything related to Ancient Egypt, I cannot but smile at this second “chance” Medjed received: he can now shine again in popular folklore, albeit inserted in a very different cultural background (incidentally, one that includes dating sims). Perhaps, given time (and more games) he can even achieve a sort of cult status among fans/followers and be included in a more definite manner in the mixed mythology of RPGs. D’Auria, S.; Lacovara, P.; Roehrig, C. (1989) Mummies & Magic: The Funerary Arts of Ancient Egypt. Museum of Fine Arts, Boston. British Museum, The. (2017) The Greenfield Papyrus. Collection online. Available from: http://www.britishmuseum.org/research/collection_online/collection_object_details.aspx?objectId=114900&partId=1 (Date of access: 09/Jul/2017). Budge, E.A.W. (1898) The Book of the Dead. The Chapters of Coming Forth by Day. The Egyptian text according to the Theban recension in hieroglyphic edited from numerous papyri, with a translation, vocabulary, etc. Kegan Paul, Trench, Trubner & Co., London. Budge, E.A.W. (1904) The Gods of the Egyptians, or Studies in Egyptian Mythology. Vol. II. Open Court Publishing Company / Methuen & Co., Chicago / London. Budge, E.A.W. (1912) The Greenfield Papyrus in the British Museum: the funerary papyrus of Princess Nesitanebtashru, daughter of Painetchem II and Nesi-Khensu, and priestess of Amen-Ra at Thebes, about B.C. 970. Order of the Trustees, London. Faulkner, R.O. (2010) The Ancient Egyptian Book of the Dead. British Museum Press / Imago, London / Singapore. Faulkner, R.O. ; Goelet, O. Jr.; Andrew, C.A.R. ; von Dassow, E.; Wasserman, J. (2008) The Egyptian Book of the Dead: The Book of Going Forth by Day. Being the Papyrus of Ani [Royal Scribe of the Divine Offerings] written and illustrated circa 1250 B.C.E. by scribes and artists unknown. Second Edition. Chronicle Books, San Francisco. Goelet, O. Jr.; Faulkner, R.O. ; Andrew, C.A.R. ; Gunther, J.D. ; Wasserman, J. (2015) The Egyptian Book of the Dead: The Book of Going Forth by Day. 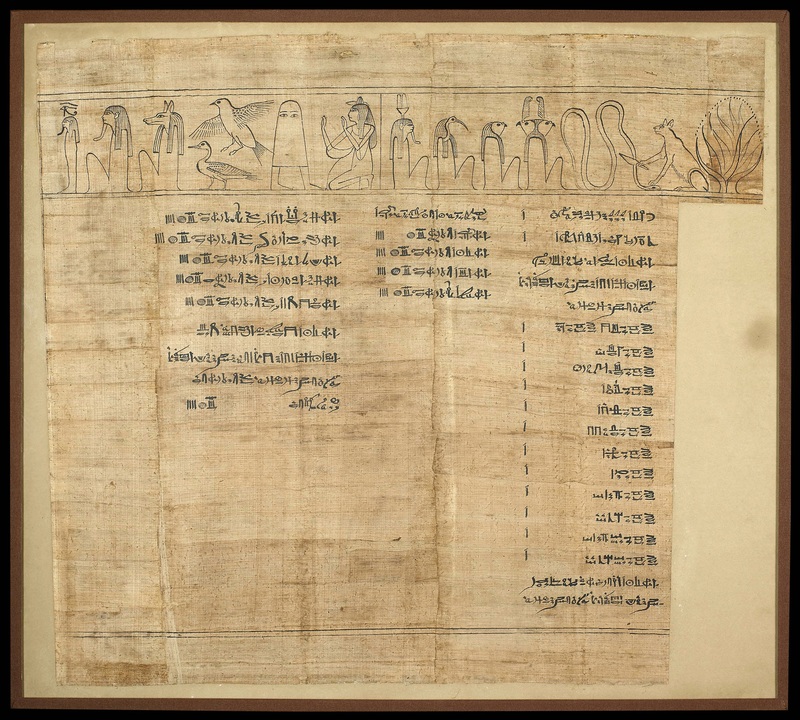 The Complete Papyrus of Ani. Featuring Integrated Text and Full-Color Images. Third Edition. Chronicle Books, San Francisco. Munro, I. (2010) The evolution of the Book of the Dead. In: Taylor, J.H. (Ed.) Journey through the Afterlife: Ancient Egyptian Book of the Dead. Harvard University Press, Cambridge. Pp. 54–79. Salvador, R.B. (2015) Egyptian mythology in the Shin Megami Tensei: Persona games. Journal of Geek Studies 2(2): 8–32. Stimson. 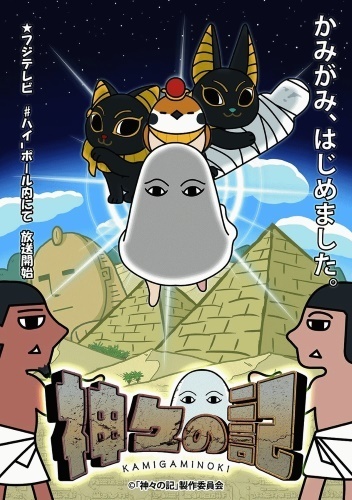 E. (2015) The obscure Egyptian god Medjed and his bizarre afterlife on the Japanese Internet. Available from: http://www.animenewsnetwork .com/interest/2015-07-31/the-obscure-egyptia n-god-medjed-and-his-bizarre-afterlife-on-the-japanese-internet/.91149 (Date of access: 09/Jul/2017). Stargate Wiki. (2017) Stargate: The Movie Transcript. Available from: http://www.stargate-sg1-solutions.com/wiki/Stargate:_The_Movie_ Transcript (Date of access: 09/Aug/2017). Taylor, J.H. (2010) Journey through the Afterlife: Ancient Egyptian Book of the Dead. Harvard University Press, Cambridge. I am very grateful to the British Museum (London, UK) for the permission to reproduce here the photographs of the Greenfield Papyrus and the Papyrus of Ani (Creative Commons, CC BY-NC-SA 4.0). Dr. Rodrigo Salvador is a zoologist and paleontologist, but he’s also fascinated with Ancient Egypt. After all, isn’t Archaeology just a tiny portion of Paleontology? One solely focused on a single very odd animal species? In any case, Persona 5 is now his favorite entry in the series, but he is sick and tired of that dammed cat telling him to go to sleep. In the sci-fi movie Stargate (MGM, 1994), the Egyptologist Daniel Jackson even makes fun of a translation of hieroglyphs he is examining: “Well, the translation of the inner track is wrong. Must’ve used Budge. I don’t know why they keep reprinting his books.” (Stargate Wiki, 2017).